*If you buy a SilverKnit you can download the RKC1000E free with your serial number of SilverKnit, and use RKC1000E for charting and calculating personal garments. The RKC1000E is for calculating the number of stiches to the width of the garment and you can also calculate how many stitches/needles to increase or decrease for the neck line and armhole. Here's what the Kruh Knits catalog says about the Brother KA3000 KnitKing Calcuknit Knitting Calculator: (No Longer Available) Calcuknit takes the time, tedium, the guesswork and inaccuracies out of charting both machine and hand knits. 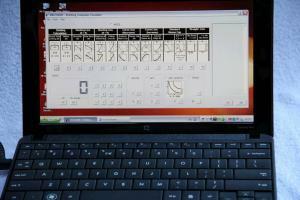 Calcuknit is simple to operate and always accurate. 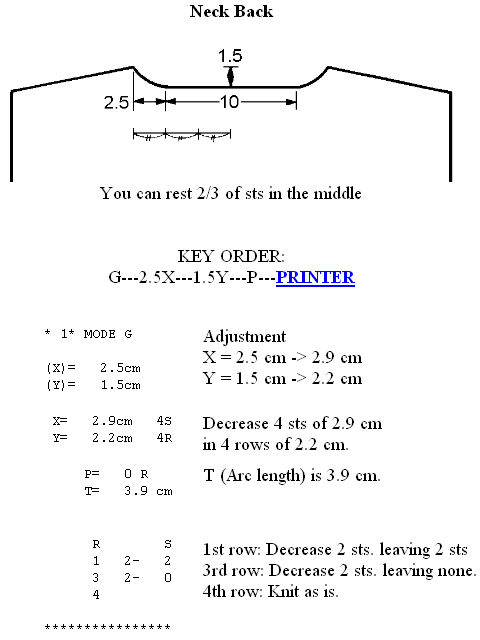 To chart garments, you feed your correct stitch and row gauge into the calculator. Follow by feeding in the garment section measurements. The Calcuknit will convert your measurements to actual stitches and rows. The next step is to feed the garment section by letter (H, for example, is a raglan shape or a V neck). Follow this with the width, in stitches, and the length, in rows, and the calculator will give you exact instructions, where to increase, decrease, etc. for your shapings. Calcuknit has three functional settings; a standard Calculator setting, a Knit Calculator setting, where it computes all of your charting, and a counter setting, with a beep alarm when you reach the programmed number of rows. Calcuknit operates on two long-life, replaceable lithium batteries. The calculator is convenient purse size and measures only 6 1/2" x 4 1/4" x 3/4". Can SilverKnit owners use the new "KC1000E Knitting Computer Emulator Software PC Download Replaces Brother KA3000 KnitKing Calcuknit Hand & Machine Knitters Charting Device"? Yes , RKC1000E is free for Silverknit users. They do not need a Key Code, but just enter the SilverKnit serial number (bottom of box) in the Key code field. This also requires that SilverKnit software is installed and SilverKnit has been attached at least one time to the PC where RKC1000E is used. There are reports that the download of RKC1000E trial doesn't want to install. This is normally due to download failure in particular with Internet Explorer. The way to download is to RIGHT click on the link and then "save target as". After that you can execute the donwload from your hard drive. You can also run directly from the website. SilverKnit, Pattern Explorer and RKC1000E downloads are alwasy digitally signed which you can verify.